...was originally a book written and illustrated by American journalist, professor and author Hendrik Willem van Loon. It was published in 1921 and a year later it was the first book to be awarded the Newbery Medal for an outstanding contribution to children's literature. However, this technicolor film, released on 8 November 1957, is notable mostly for its campiness. It's included in the Medved Brothers' Fifty Worst Movies of All Time and it received a Golden Turkey Award in the category "Worst Casting of All Time". Scientists have developed the "Super H-bomb" which, if detonated, will wipe out the human race. A High Tribunal is called in Outer Space to decide whether Heavenly intervention should be allowed to stop the bomb's detonation. The Devil (Vincent Price) prosecutes mankind while the Spirit of Man (Ronald Colman) defends it. Price and Colman are allowed to take the tribunal to any period of time to present evidence for mankind's salvation or damnation. They take the tribunal from prehistory through Egyptian, Greco-Roman, medieval, Renaissance, Enlightenment and modern times, looking at historical figures played by a host of guest stars including Hedy Lamarr (Joan of Arc), Virginia Mayo (Cleopatra), Peter Lorre (Emperor Nero), Marie Wilson (Marie Antoinette) and Reginald Gardiner (William Shakespeare). And then there's the three Marx Brothers, re-united for a last motion picture - but employed in three separate episodes! 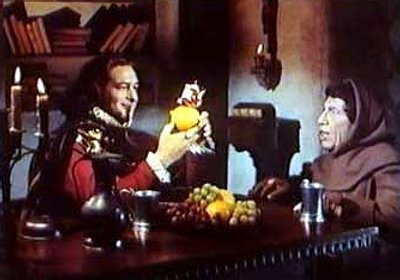 Chico appeared as a monk advising Christopher Columbus (Anthony Dexter) while Groucho played Peter Minuit, the Dutchman who conned Manhattan Island from the Indians, prefering his cigar when offered a peace pipe. Among the indians were composer Harry Ruby and Groucho's third wife Eden Hartford. 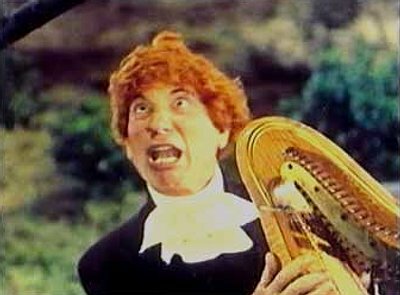 Harpo appeared as Sir Isaac Newton, quietly playing his harp in an orchard when not ONE falling apple but a bushel make him discover gravity. In the film there's an episode with Napoleon (Dennis Hopper) and Josephine (Marie Windsor) and to think that director/producer Irwen Allen had the Marxes at hand but DIDN'T use their united force to revive the classic Napoleon-scene almost justifies the Golden Turkey alone! The film ends before the tribunal has decided on the fate of mankind. Red letters on the screen just ask IS THIS THE END? "We can only hope so", the Medved Brothers concluded.